Suitable for most cycle applications and specified by many manufacturers ABEC 5 bearings are made to meet a higher standard than standard bearings. 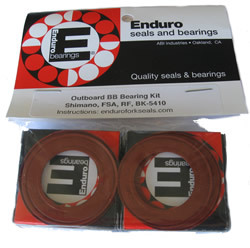 Enduro ABEC 5 bearings are made to meet the higher ABEC 5 standard. Grade 5 Chromium Steel Balls, 52100 High Carbon Chromium Alloy Races and Nylon with Graphite Retainers. Seals are typically SRS and some LLB. If this is in a front hub and marked 61903 or 6903 please check the ID. Some of these bearings have a 18mm ID instead of the normal 17mm. If this is the case you need a 18307 bearing.